We eat stir-fry at least twice a month. (Nick would eat it more often, if I let him.) Our favorite version includes sesame oil and oyster sauce, garlic and ginger, mushrooms and bean sprouts, and noodles. However, our go-to dish may now have some competition for the top spot. This recipe comes from Iowa Girl Eats. The sauce is simple, the veggies are plentiful, and the peanuts are salty and crunchy. First combine rice vinegar, soy sauce, sugar, peanut butter, water, and chili garlic paste (found in the Asian aisle of your supermarket). Microwave for 20 seconds, whisk until smooth, and set aside. Then slice and cook 1 large chicken breast in peanut oil. (You could also easily omit this or substitute tofu for a vegetarian version.) Remove and set aside. The veggies come next. We used green onions, garlic, sugar snap peas, asparagus, broccoli, and coleslaw mix. Be creative! Add more peanut oil to the wok, and saute the mixture. 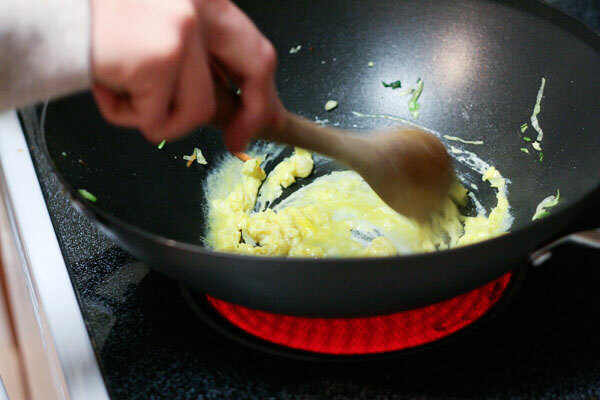 … and quickly scramble it in the pan. 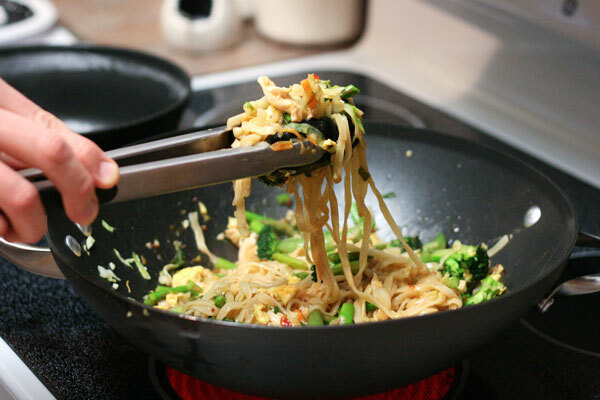 Add cooked chicken and vegetables, along with cooked noodles and sauce, back to the wok, and toss to combine. 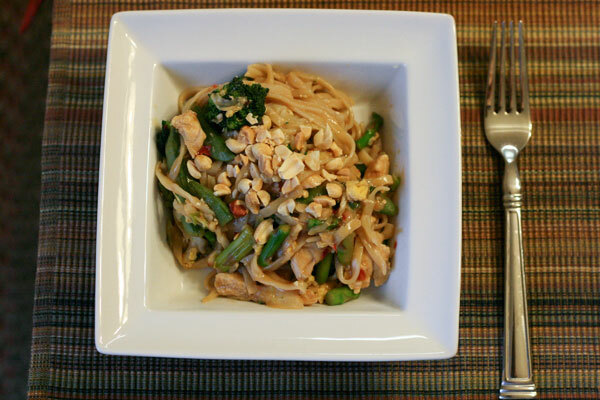 Garnish with chopped peanuts and sliced green onions. Devour! 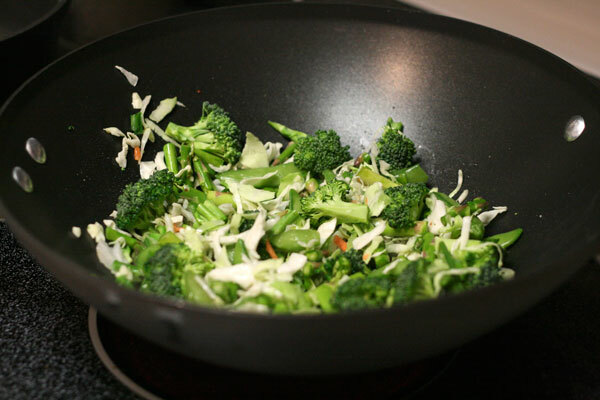 Do you have a favorite stir-fry? Add sauce ingredients to a microwave-safe bowl. Microwave for 20 seconds, then stir until smooth. Set aside. 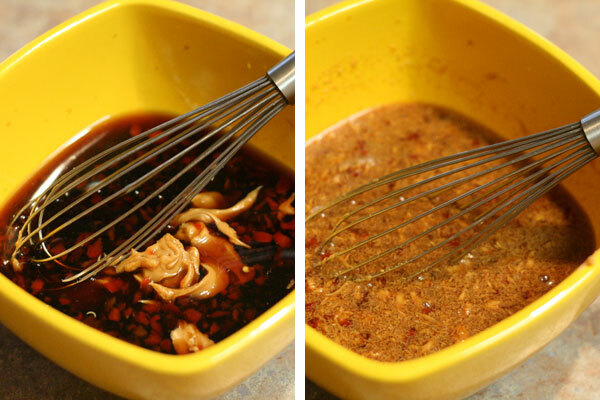 Heat wok on medium-high heat, and add 1 teaspoon of peanut oil. 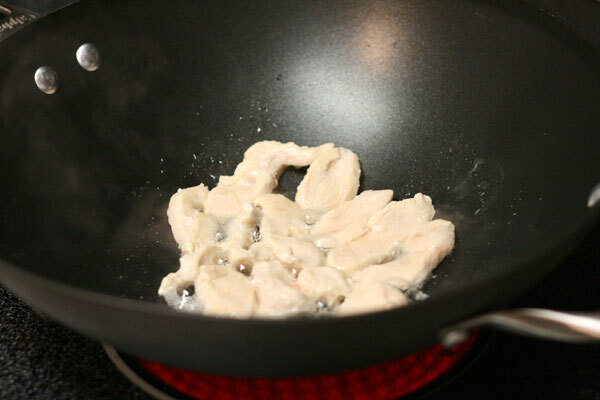 Season chicken with salt and pepper, then add to wok and cook, stirring frequently, until done. Remove and set aside. Add the other teaspoon of peanut oil to the wok. 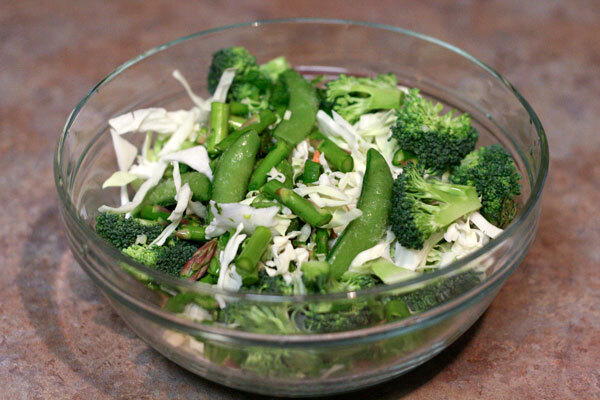 Add green onions, garlic, sugar snap peas, asparagus, broccoli, and coleslaw mix. Cook, stirring frequently, until vegetables are tender and coleslaw is wilted, about 3 to 4 minutes. Remove and set aside. 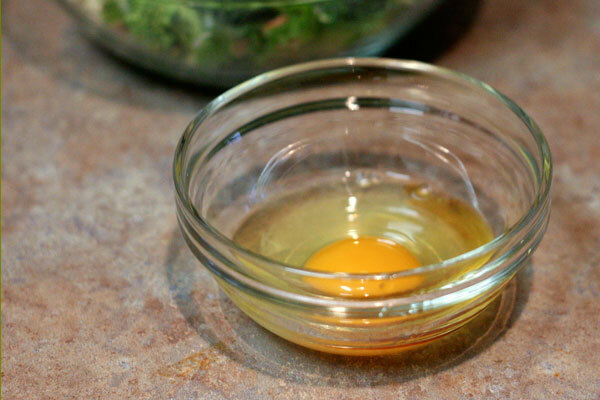 In a small dish, whisk together egg and a dash of sesame oil. Add to wok and stir constantly until soft scrambled. Add cooked chicken and vegetables back into wok, along with cooked noodles. Pour sauce over top, and toss to combine. 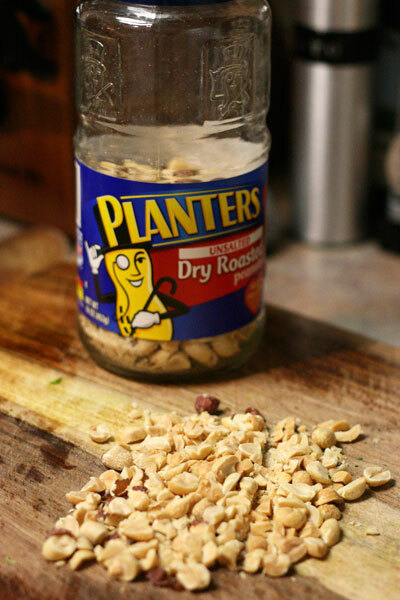 Garnish with chopped peanuts and extra sliced green onions (and more chili garlic paste, if your name is Nick). Hot Damn! We love that recipe! Made it a couple of weeks ago and cannot wait to add it back to the rotation!! Oh that looks AMAZING! why oh why does my husband not like asian food like I do??? These look incredible! I’m salivating. You really can’t taste the egg, and I think it’s fine to omit it. If you do, though, add a few dashes of sesame oil to the veggies so you don’t miss out on that flavor. Enjoy! I love IGE! I need to try this recipe out. I love Thai…especially when there are peanuts!! Congratulations on your pregnancy by the way! I can’t wait to make this, to bad Allen doesn’t eat anything that isn’t fried and covered in hot sauce. Tell Allen to add more spicy chili garlic paste to the dish, and he will love it. Promise! I love this dish! So versatile and good. Peter always insists on extra hot sauce, too! yum! i can’t wait to try this. i love thai food. 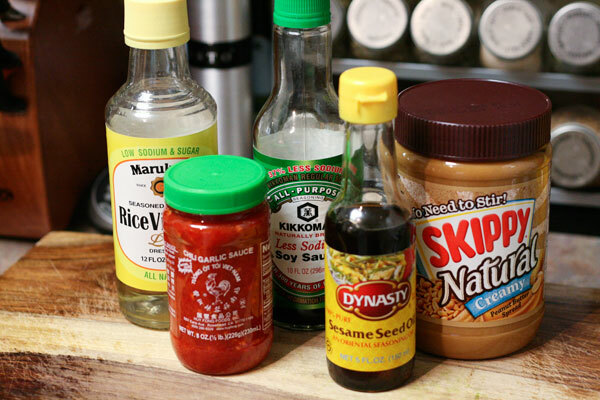 and anything that has to do with peanut sauce. I made this last night and it was excellent! Thank you for the great recipe! Thanks! 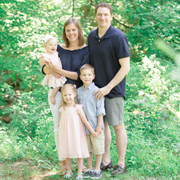 We are going to the beach next week with my husband’s family. He loves thai food and I was looking for something healthy to make. Not sure if the whole family will go for it, but this is just what I was looking for. Think I will do whole wheat fettucine (will look at nutrition info for different noodles). Think I will also add some roasted sesame seeds. I am following weight watchers and this will fit right in! 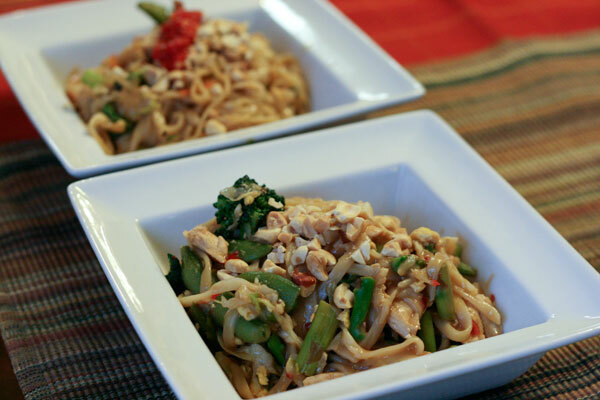 I may never order takeout Thai food again after trying this recipe a couple of nights ago! Wow – so delicious! I didn’t have peanut oil so I just used canola, I’m sure it would be even more peanut-tasting with the peanut oil…I’ll try that next time! I’ve already shared this with lots of family and friends. Thanks, Emily! I am a bit late to the party here, however I wanted to comment that I made this last night and really liked it, however it was a bit too salty. I used reduced sodium soy sauce. Is it possible my Rice Vinegar was the issue? I see you used a low sodium Rice vinegar. Any thoughts? What was your brand and what was the sodium content on yours? Thanks!